This Cream Cheese Frosting with Swerve Confectionars Sugar Substitute is a life saver with all of the pumpkin recipes we will be seeing soon. 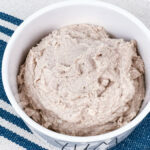 Use this frosting for cookies, cakes and more! Then use a spreader or a pipping bag to smoothly add your icing to your dessert. Can be stored in a closed container for a week.